It won’t feel official until we sign the papers, but we SOLD OUR HOUSE. With three days of showings and ten offers, it was an insane time of joy and relief. We are totally going to miss the place that was our first home. But are so glad to get to move forward. More on that part later when we know where we are going. (Insert minor freakout: we move in 5 weeks and DON’T KNOW WHERE WE ARE GOING.) For now, I thought I’d leave you with some tips to sell your house, FAST. The market has everything to do with it. I would also use a sharp realtor who knows your area, the correct way to price your home based on comps, and is good at negotiation. Personally, we also believe in God’s timing and plan, but there isn’t really a way to figure that out ahead of time. Before we begin on the tips, realize you need to be as smart as you can about timing and the market. But keeping all that in mind, here are my tips to sell your house fast. Young House Love introduced me to caulk and now I can’t walk into a house without immediately noticing what needs to be caulked. What is caulk and where does it GO? you may be wondering. In short, EVERYWHERE. 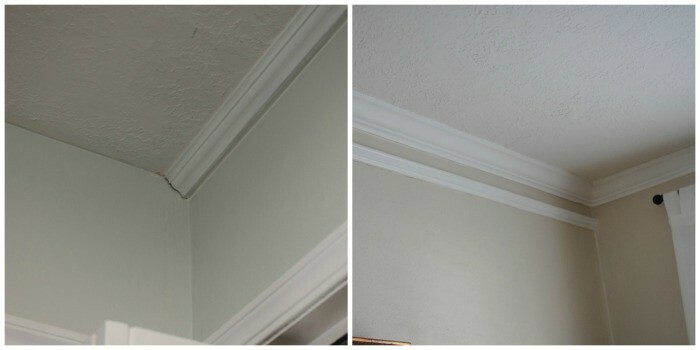 Trim to ceiling or walls. Cabinets to walls. Around toilets or bathtubs. If things are properly caulked, you’ll never notice. If not, you’ll see weird gaps and things just look messier and unfinished. Here you can see (in two different rooms) uncaulked molding and caulked molding. Now you’ll see it everywhere. It’s really not hard to do, though I’ll warn if you’re messy like me, you will have this on your hands, in your hair, and pretty much on places you didn’t know existed for days. Have a tarp or towel and a bowl of warm water. YHL has the best tutorial on this so if you want to dive into caulk, go check that out, and realize that there is no turning back. On the left is the pre-paint, pre-caulk window sill. On the right, completed. BOOM. Polished. Finished. A $10 fix. TIP: Use baby wipes to clean your finger! I tried soap, water, even paint thinner, but baby wipes beat them all. When we bought our first home, we looked at one house and hated everything. 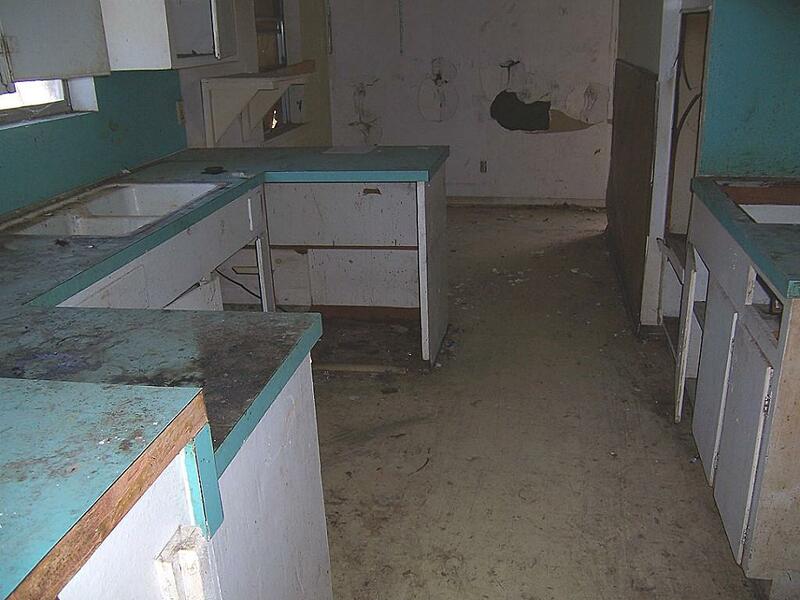 It was a whole lot of ugly, but what really bugged us was the floor plan. “I’d never live in a house set up like this,” I told Rob. We thought we could see past the wallpaper and the mustard yellow kitchen counters to see the bones and the bones were just bad. But then we bought a house with the exact same floor plan. And we didn’t notice until we had lived there a month. The house we bought was the exact same floor plan but had neutral colors and a few updates. While we thought the bare bones of that first house bothered us, we didn’t even notice those problems with a new coat of paint and a few other small updates. Paint matters. Color matters. It doesn’t mean your house won’t sell, but it could make a huge difference in ways you can’t even imagine. 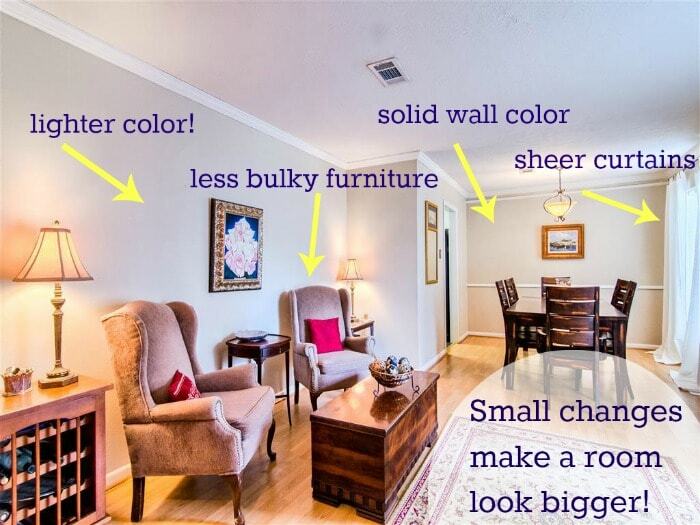 Ask your realtor about colors, but in general you want lighter, more neutral colors that make rooms seem larger and more palatable to strangers. Don’t take it personally. It doesn’t mean people don’t LOVE your red kitchen. 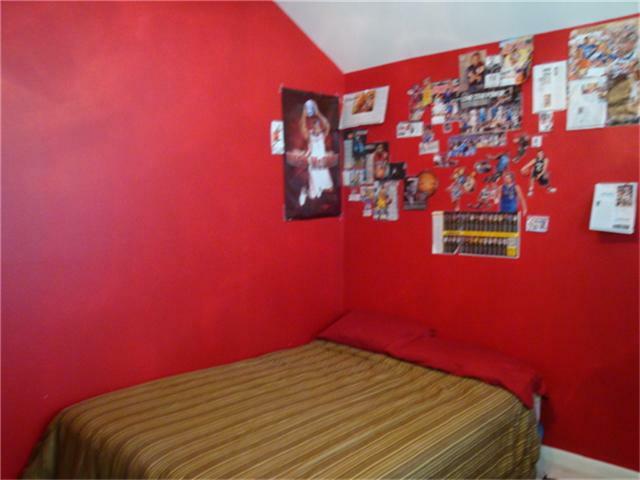 (I love red walls, by the way.) But it may detract potential buyers, and that’s all you care about. Here are a few before and afters and if you want to see the full before you can check the old blog for the last go-rounds. 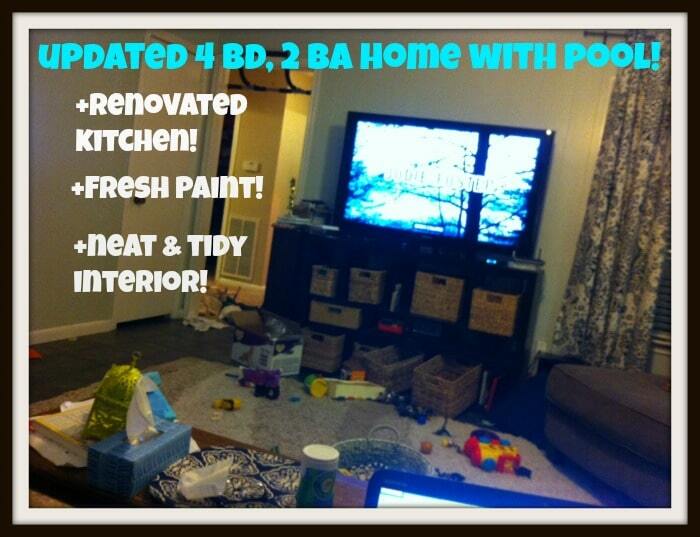 I think the new color in our dining/formal living makes that space huge! Tip: My favorite choices come from a leaflet you’ll find in Home Depot in the Behr section called Lights and Brights. Fabulous choices, but all very palatable. Ask around for recommendations of reliable and affordable handymen (or women) and take care of those issues. (Again, your realtor probably has a good list.) We did some of this, but left some of it out and we are now probably going to end up paying more on the tail end because the inspector noticed them. Anything you can keep the inspector from flagging will save you money. (Please know I don’t mean HIDE things, I mean actually take care of them before the inspection or even before people come to see your house.) The best idea, of course, is to take care of these issues as they arise, but most home owners fall prey to that idea of deferred maintenance. Don’t do it! But if you did, now is the time to take care of those things. Little things add up at the closing table. This is one of the hardest steps for me. I am not as messy as I used to be, but I am cluttery. I don’t throw things out or deal with them in the moment. Rather, I save everything for months until that one moment when I’m like, WHAT AM I SAVING THIS NAPKIN FOR?? and throw it all in the nearest trash can or set it on fire in the outdoor fireplace. I know this, and yet I continue to do this. Forever. Even if you’re better about things than I am, maybe your clutter is in the form of your million pairs of designer shoes or your husband’s tie collection or your kids’ toys. Round all those things up and find a lovely box to store them. Preferably at a friend’s house until the house sale thing is over. What’s your weird thing? (No, really—I’d love to know in the comments.) Maybe it’s those big-haired trolls from the 90s. Or perhaps you like something a little more refined like porcelain figurines or antique clocks. When your friends, who get you, come in and see your collection of glass dolls, they still like you and aren’t terrified, because they are your friends. Strangers walking into your home will see all those waving-hand cat statues as a sign they should say goodbye. Don’t literally put it under the bed (see: clean it up and clear it out), but definitely hide those special things that make you unique. 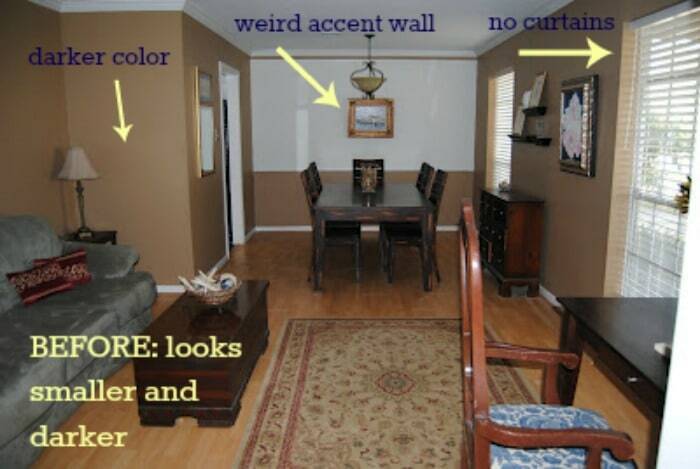 Your “unique” is a potential buyer’s “way too weird.” This photo, from a current listing in Houston, shows a house that needs a little paint help and some weird fixing. I’ve been moving toward more safe cleaning for our household for a while now. 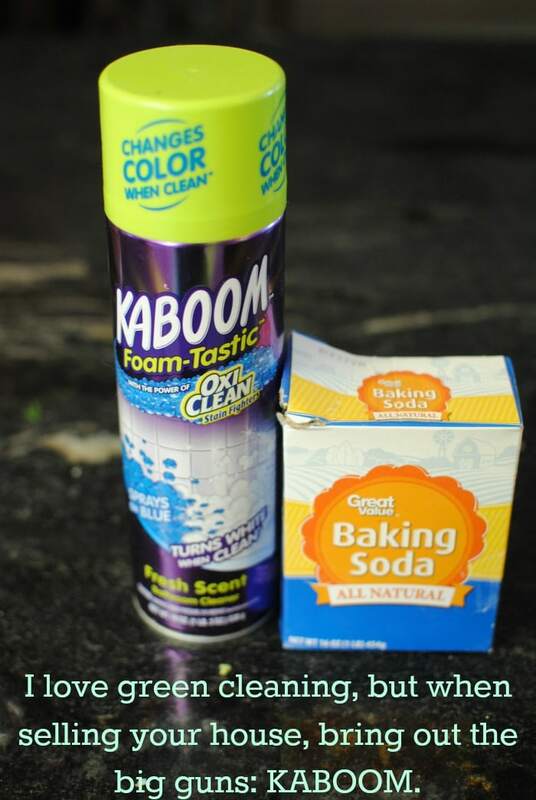 I love using lemons, vinegar (though I HATE the smell), and baking soda, but there is a time and place for Kaboom. This is that time and place. And unless you are gifted in the cleaning arts, it’s a great idea to hire someone to come even once to clean professionally. Our house looked good before she came. Then it looked AMAZING. If there is a time to use the biggest, baddest cleaners and bring in a professional, this is the time. There are so many affordable things you can do to make your home look fresher, cleaner and newer. I change out the burner pans every two years or so. For under $10, I can replaced the messy, crusted, burned pans under my burners with shiny, new ones. I was too embarrassed to even take a picture of the before. But this is a 7-year-old stove top, and I think it looks pretty fresh. Our toilet seats had long been screaming for a replacement, but it was one of those things we got used to living with. The finish was cracking, revealing the brown wood underneath. (Which really looks less like wood and more like poop when you go to use it.) For $6 a piece, we bought new toilet seats. Viola! Fresh-looking toilets. Curtains are another quick fix that make so much difference. I spent just over $50 buying four panels from Ikea and two rods from Walmart. Rob hung them high (a trick for making rooms look taller) and I can’t believe the difference. Our room looks more finished, more expensive. I like them so much that I actually wrote into the contract that we would take them with us. I’m not the most into curtains, but a few nice, sheer panels can really add to a room’s appearance. These photos really illustrate this, even if you’re looking past the bad quality of this first photo (I had to download from online) and this second one, taken by a pro. I love how the color changes, also changes the space of a room, it seems that color fools the eyes thinking its more wider, i think the dark color makes the corners more visible does cutting the entire room small. For me a white painted wall is too flat, so pastel color is much better as it gives a little texture on it..
its a good decision to have a less bulky chairs, it gives more space and a thinner or slimmer looks..
I’m not big on white either, though it seems to be everywhere these days from blog designs to homes. a little color is so helpful! I really love the color changes and the simple design that makes the house look a lot better. The problem is when the house starts looking that good you start not wanting to move. Everything seems more comfortable and has a better living environment. Thanks for sharing. I am Jimmy with Daybreak Media Group. My company represents a leading provider in roof repair and preventative maintenance. They would like to purchase ad space on your site’s page, kirstenoliphant.com/2014/03/24/tips-to-sell-your-house-fast/. I agree that you should tone down your paint. I think that will make the home appear more inviting. I think when walls are too bright, people feel uncomfortable. I like your tip to clear out clutter and outdoor debris when trying to sell a house. Clutter and debris can create a bad impression of your house, so getting rid of things can help a lot. I like your tip to clean the gutters and trim the trees as well; after all, the exterior of the house is the first thing potential buyers see, so you want to make a good first impression. Thanks for the tips. I think it’s great that you mention paint and fabric as great ways for decorating a home. I agree with you on that point! I don’t have a lot of money to buy furniture or different decor items, but I can paint. I think I’ll take your advice and paint my bar stools. My wife will love it! Thanks for sharing these great tips to sell your house fast! “Caulk in the Name of Love” made me laugh; I had no clue about the baby wipes! 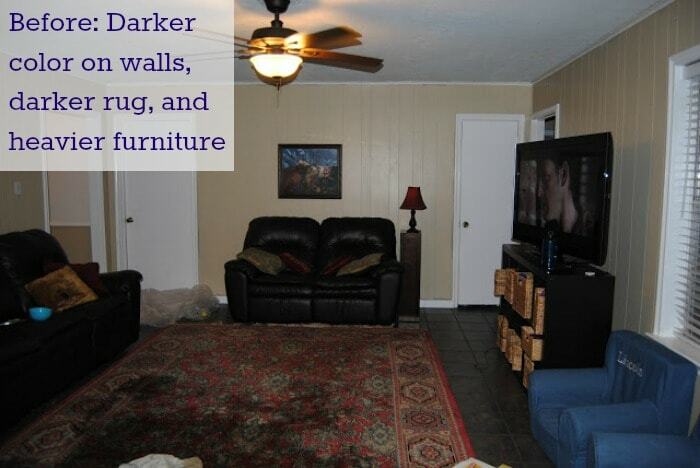 All of the after photos look great. Love all the color changes! You make a good point about getting a second pair of eyes. You may get used to seeing something and not having an issue, but a neutral view could add a whole new perspective. I can’t believe the difference some new paint and lighter furniture makes on a room; if you hadn’t told me, I would’ve believed those were different homes! Great post, thanks for sharing! My husband and I are getting ready to sell our current home, and are in need of some advice on how to make the process go fast. I like how you said that one thing we can do is freshen and tone down the paint. Since that is might be better for us to have neutral colors, so that potential buyers can see it as something that they turn into their own space. 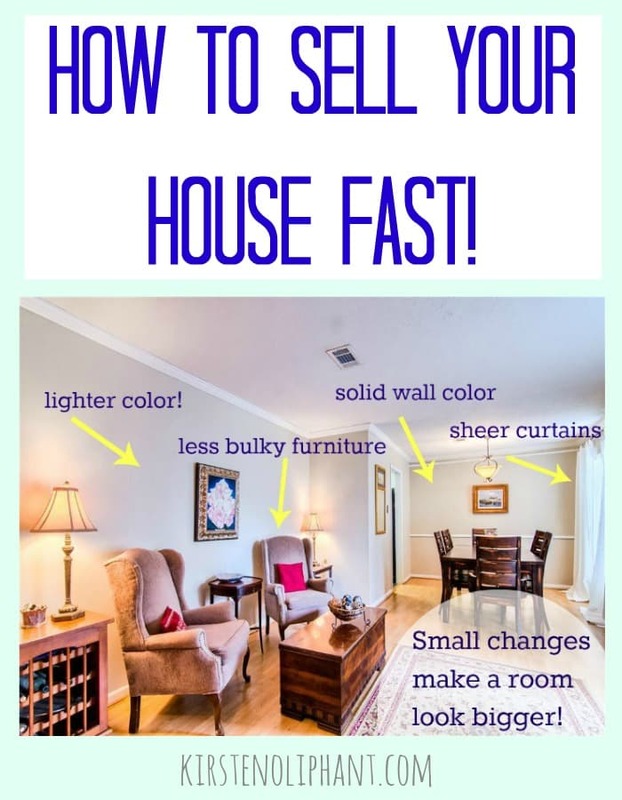 I really appreciate your tip to clear out all clutter.They give a bad impression to anyone who is new.You describe about the paint and fabric very nicely.This things are very important for the first impression.And what do you think of bulky furniture? Replacing them with less bulky furniture is good, right? Very helpful post to change a home overnight.Thanks for sharing. These are amazing tips for selling a home fast. I like when you talked about the painting of the home. Like, well-selected paint colors can actually make a tremendous difference. I love these ideas what i loved the most is the placement of each and everything well 🙂 either its painting or sofa. Thanks for sharing the effective tips! Completely agree with you, we must prepare our house by having it inspected and identify damaged parts that could not be noticed by us and get them repaired and you are right about house should not be an eye sore, first impression is the last impression still holds very much. So a beautiful landscape and good looking house and in top shop are prerequisites for an excellent curb value, otherwise be ready for it to be sold at dirt prices to a wholesaler. These tips are effective and useful. If we place the thing very well then home would be look spacious and painting also plays a huge role if we choose right paint for home. It enhance the beauty of home. I’m trying to sell my old house and I’m thinking on what I could do to catch the prospective buyers attention. I’ve read that paint matters and I think that I have to agree on that with you. It’ll really make a huge change for an old house to look new with a fresh new coat of paint. Thanks. This is some really good information about selling a home. I liked that you pointed out that you should freshen up your paint job in your home. It does seem like a good idea to have a professional help you do that. After all, I wouldn’t want to get paint on my carpets. I hadn’t thought of it before, but the article makes a really good point about hiring a handyman. 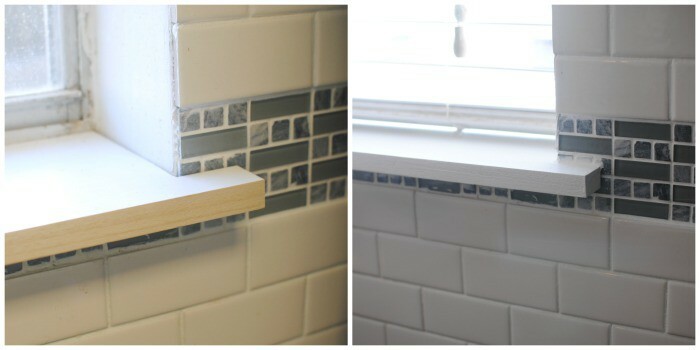 After all, while you might not be able to afford making any big repairs before selling your home, you can still make some small ones. After all, doing small things such as replacing the light switch covers and sealing up any small holes in the wall could be the difference between whether or not someone buys your house. Thank you for sharing such a nice and useful article. I agree that we could sell a home quickly by taking certain steps which is described in this article. However, we could also sell our home instantly by contacting with real estate companies who acquires home and other economical properties within no time. Such companies deals with huge real estate transaction and could offer a profitable deal to the seller. You did an amazing job. The before and after is amazing. I like how you list it down.. de-cluttering is really important you dont want your house to look as if it is owned by a hoarder..Thanks for posting this and Best Regards! Your post is really informative for each homeowner who wanna sell home fast for good value. I have liked your post because I got some helpful point inside your content. Also, I got another similar source named grable property solution who can help everyone to sell their houses quickly and stop forecloser. I agree with painting neutral colors because not only it makes your house looks attractive but also it makes the house looks new and its way cheaper. Great tips by the way! Good Read on this one. 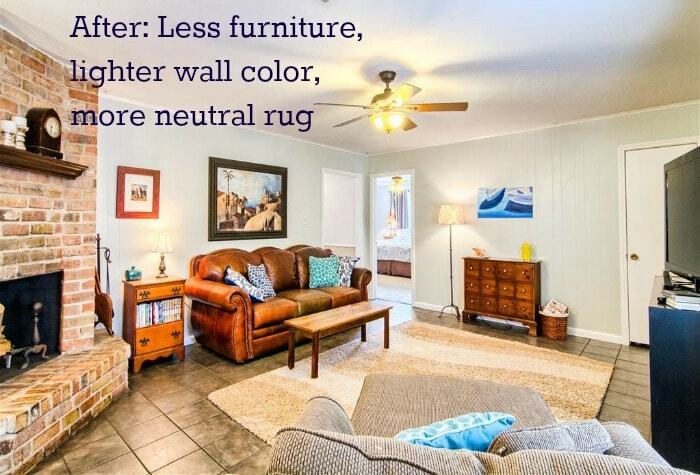 picking the right color combination is essential to make the place appealing. also Most people want to hold on to the house, being too sentimental/emotional and feel doubt in selling it or makes unrealistic price to the house. great tips. I love how you explain the tips by details. Awesome tips! thanks for writing this one. This is really a big help to those who are planning in selling their house in a fastest way! Anyway, maybe you can also visit this site FortHomeBuyers, they buy house regardless of the condition. I like how you said to freshen and tone down your paint in your home. My parents are trying to sell their home. Thanks for the tips on selling a home fast. There really are a lot of things that you can do to help sell your home faster and I like that the article goes over several of them. I particularly like that it suggests clearing your home out. After all, if you depersonalize it a bit then you can make it easy for potential buyers to imagine themselves living in it. Selling a house quickly does seem like a difficult thing to do. I liked what you said about how freshening up the house will do a lot of help it sells faster. That does make sense because I wouldn’t want to have to do that to the house before moving in. I am glad to have all additional information. Tips to SELL YOUR HOUSE FAST is really interesting as well as informative. I will share this article with another users. Thanks!